Ralph Mooney died last Sunday and calling him a pedal steel pioneer seems woefully inadequate. He was the crucial link between Bakersfield country and Texas outlaw country, the two most significant reactions to the Nashville Sound between 1955-80. Think about this. Moon played for Wynn Stewart at Wynn’s peak (1950s-’60s), played for Waylon Jennings at Waylon’s peak (1970-80s), and in between helped Buck Owens and Merle Haggard reinvent country music. And though he wasn’t really known as a songwriter, he co-authored “Crazy Arms” with Chuck Seals in 1956, all but creating the Texas shuffle. In the “Less is More” Hall of Fame there’s a statue of Ralph Mooney … or, there would be, but the statue is pretty much implied. Why show off? 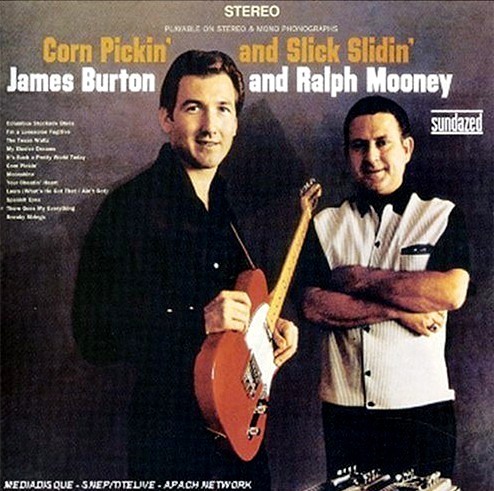 The only album featuring a marquee Moon, Corn Pickin’ and Slick Slidin’ is an astute pairing because Burton and Mooney followed similar career paths. They were important sidemen for a pair of well-known artists (Burton with Ricky Nelson and Elvis) and both of their stints sandwiched unheralded, badass session work. Unique among those sessions was this album, recorded in November 1967, and released in 1968. God only knows how great this album would’ve been with Roy Nichols, but James Burton is a helluva backup plan. Burton kills it on guitar and dobro with monster riff after monster riff, but Moon effortlessly holds his own. He had a wonderful sense of rhythm, floating on top of the beat one moment, subtly pulling against it the next, and always with a zen-like sense of economy. But really, Ralph Mooney’s genius was that until he came along no one sounded like him, and then after he came along everyone sounded like him, or at least knew his licks. He used the steel to invent his own language and it immediately become a fundamental part of the country music vocabulary … and God bless him for that. RIP Moon. What an artist.. RIP Ralph.